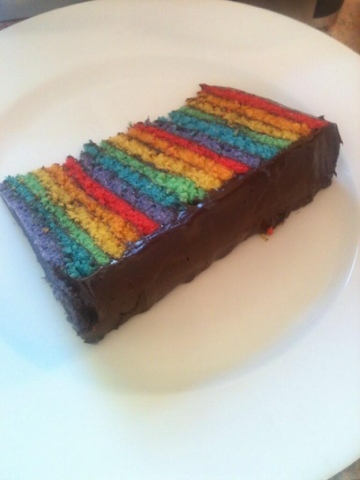 Abbies Baking Blog: Triple rainbow chocolate cake! Wow, it has been so long since my last post! I'll start with an update- I am now 17 years old and currently doing A-Levels at school. 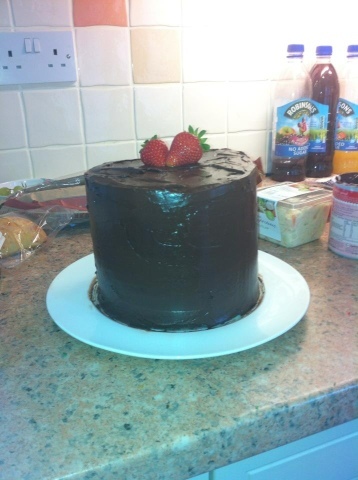 I still do baking, just not as often now, too much school work! But I made a cake yesterday, and I thought I would share that and a few other baking projects I've done since leaving this blog so enjoy! Excuse the photos, the iPhone 3GS isn't known for its camera quality right? 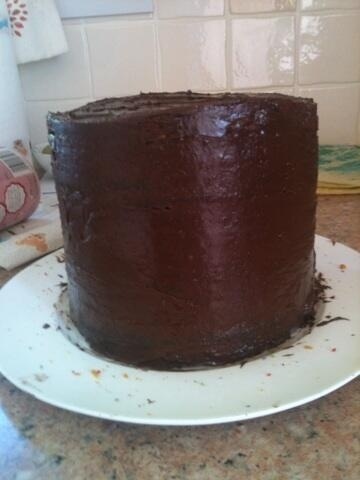 So this was the cake after I'd crumb coated it, so the icing isn't perfect and especially not even (the icing used was Betty Crocker chocolate fudge icing, one pot managed to fill the layers and crumb coat the outside). 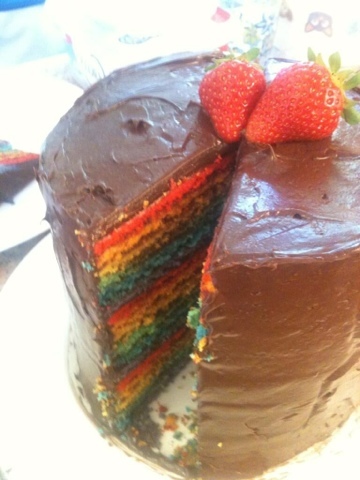 And then you cut into it and... Eighteen layers of rainbow goodness! Each little layer took ten minutes to bake and we had three tins, which is why it took so long! I kept the decoration simple because it was the inside that needed the attention, and I also didn't have much time! And here is the first slice! Americolor gel food colouring in super red, orange, egg yellow, leaf green, blue and purple (sorry I can't remember the names of these). 2./ add one egg at a time (already whisked with a fork) and with it add one tablespoon of flour, whisk until mixed. Repeat this with the rest of the eggs. 3./ add the rest of the flour, and whisk. 4./ separate the cake mixture evenly into six bowls and add a couple of drops of food colouring to each bowl so you have each colour and make sure they are fully mixed. 10./ spread a thin layer of icing on the top of the cake and round the sides (don't mind the crumbs showing in the icing) and chill for twenty minutes until the icing has set. 12. / add any decoration you want and enjoy! Well this has been fun, I may start uploading again! Bye!